The last day of riding. We got up early (for Hoogs) to eat breakfast and to give Robert a send-off (and then there were three). The skies were pretty clear and we decided we could ride partway to Rome on smaller, fun roads. It is surprising that there are isolated, small towns built into mountainsides within fifty miles of Rome. It was cool, 7 degrees, but a great way to end the ride. 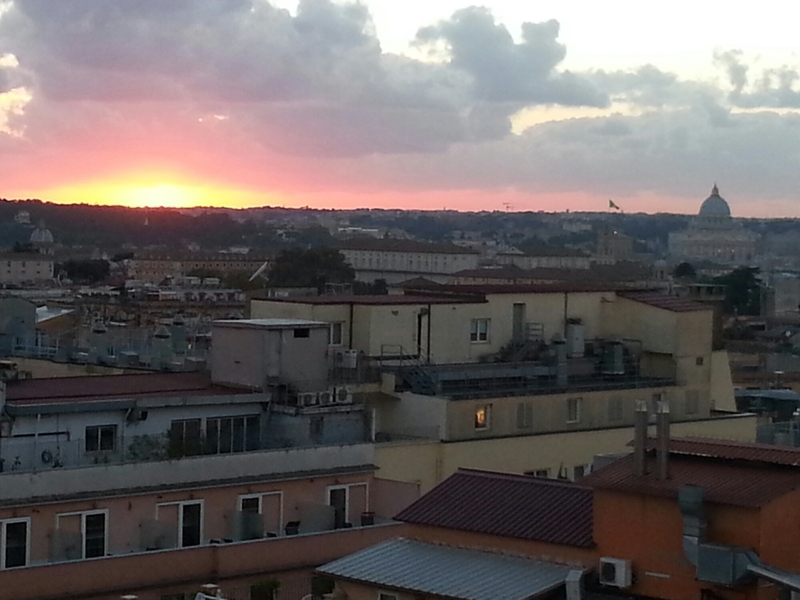 Eventually, we had to get on the super – slab into Rome. Unfortunately, Josef’s Garmin routed us off of the ring highway into the city traffic. One more dose of buses and scooters conspiring to take us out. We made it to the shop ahead of our 10:30 deadline, shocking, checked in, paid up, changed, said goodbye to Josef (and then there were two) and caught an Uber cab to our hotel around 1:00. This left Josh and me with a half day to play tourist in Rome. We checked in and bought hop on/hop off bus passes for the main sights. Similar to Carol and my four hour Rome blitz, we saw the Colliseum, Forum, Vatican City and a few other landmarks, finishing up by 5:30. 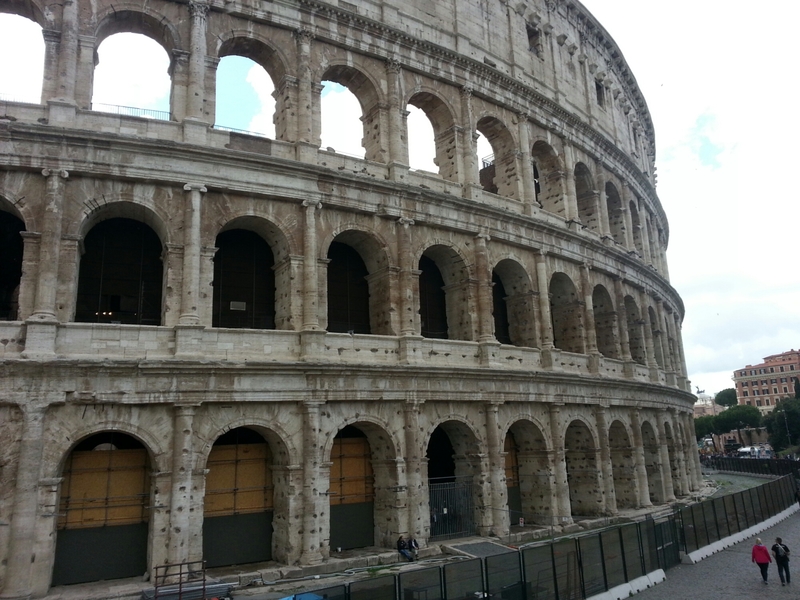 No Pope sighting, but lots of antiquities. A panorama of St. Peter’s Square. We finished the day with a stroll around the streets to check the nightlife and a gelato. 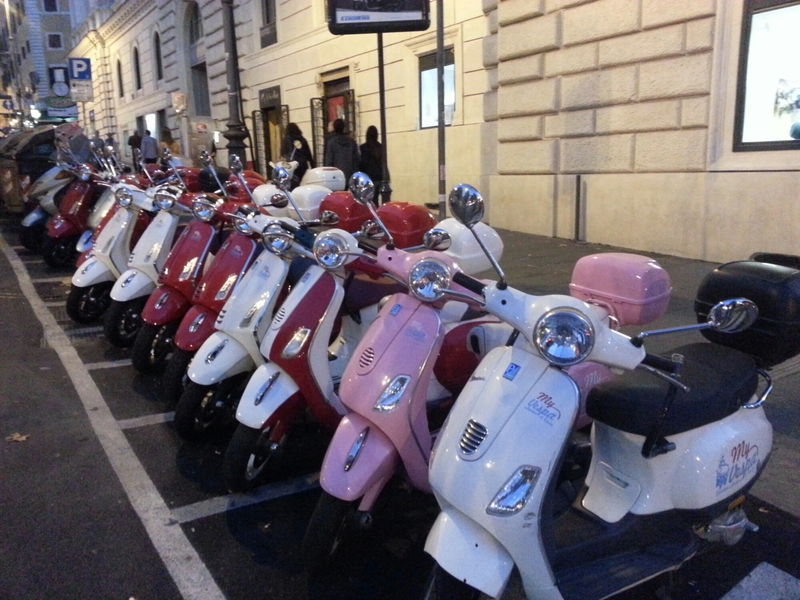 This is for Ben… Vespa’s all lined up, and pink. That’s about it. Tomorrow morning I day goodbye to Josh (and then there is one), catch a train from the Termini next to the hotel to the airport, fight to Detroit and then the last leg home. I’m ready to be done. I might do a recap when I get home on the trip as a whole and my thoughts for the next adventure on two wheels. Stay tuned.